Today we’re looking at the specialist VAG tool no. 3357 used for filling or checking the oil level in the manual gearbox of various Volkswagen and Audi cars, including some models of VW Polo, Fox, Golf and various Audi, Seat and Skoda models. Opening the gearbox filler plug to check the transmission fluid level or to change the gearbox oil on your car can only be done using one of these specialist tools that is not found in your usual mechanic’s socket set. VAG Tool 3357 for VW, Audi, Skoda, Seat, etc. 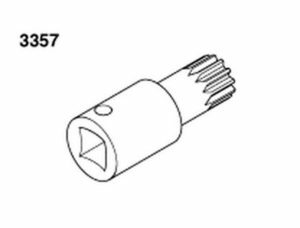 The 3357 tool from VW is effectively a 16mm splined key with 12 splines. Available with a square drive of either 1/2″ or 3/8″ to be compatible with the ratchet handle in your socket set, this tool will help the DIY mechanic easily check their gearbox oil. While sometimes hard to find, if you don’t want to pay a Volkswagen dealer an extortionate amount have a look on our shop page to see where to buy your VAG 3357 tool. Let us know below if this tool fits your car! This is the special triple-square socket for the transmission drain plug, a.k.a. Audi special tool 3357.